Apalachicola F.Ty. 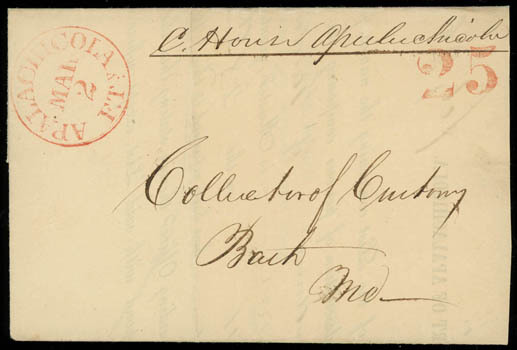 Mar 2, type III cds in red with matching type B "25" on 1845 folded partly-printed Apalachicola Customs form to Bath, Me., Very Fine, The latest recorded pre-statehood type IIIB combination. 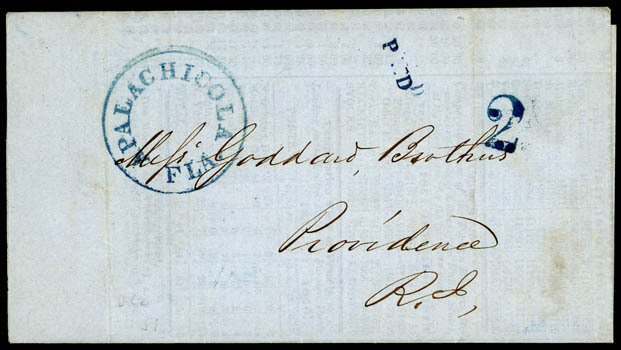 Apalachicola Fla., undated type IV circular handstamp in blue with matching type d "Paid" and type C "2" on Dec 22, 1851 folded Apalachicola Prices-Current to Providence R.I., Extremely Fine. 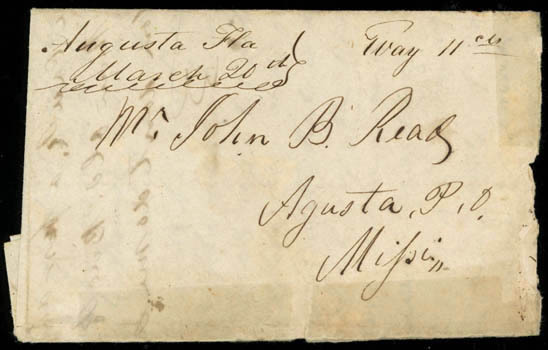 "Augusta Fla, March 20th", type I manuscript postmark on 1847 folded letter to "Augusta P.O." 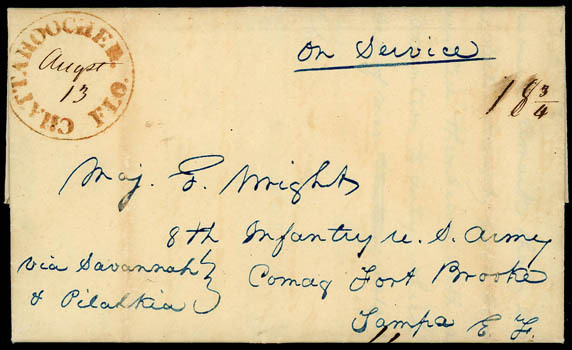 Miss., manuscript "Way 11 cts" rating for the 1¢ way fee plus 10¢ postage for over 300 miles; cover faults, Fine, This is the earliest recorded usage from Augusta, ex-Light. 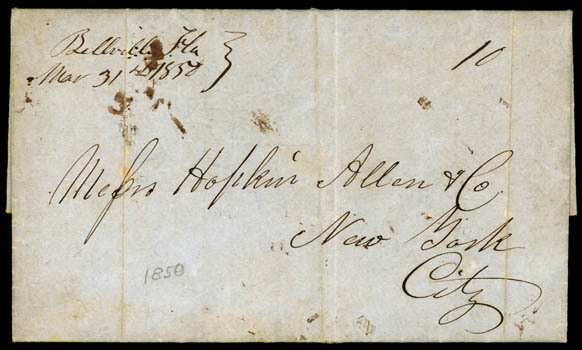 "Bellville Fla, Mar 31st 1850", type I manuscript postmark and "10" on folded letter to New York; bit of blotching in postmark, F.-V.F., One of only six recorded type I Bellville manuscript postmarks, ex-Light. "Campbellton Fla, Feby 22", type II manuscript postmark and "10" on ca. 1845 folded cover to Granville Co., N.C.; faint allover toning, Very Fine. 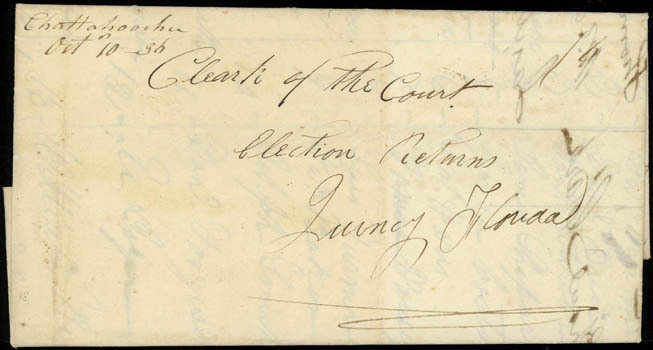 "Chattahoochee, Oct 10 36", type I manuscript postmark and "16" on 1836 folded letter (local election returns) to Quincy, Fla., Very Fine, ex-Bleuler. 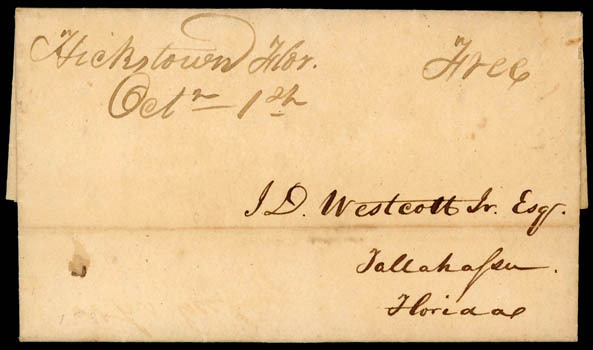 Chattahoochee Flo., "Augst 13", red orange circular postmark with manuscript date (type V) and matching "18¾" rating on folded letter datelined "Apalachicola Arsenal, Chattahoochee Florida 1843" to Maj. G. Wright, Fort Brooke, Tampa E.F., endorsed "via Savannah & Pilatkia" and "On Service", letter from a surgeon who writes that a corporal of the guard had "the audacity to request my wife to meet him clandestinely the next night", the "scoundrel was confined" and he wants another guard "who has proper notions of morality and propriety sent in his place" etc., interesting letter; file folds, Very Fine and scarce. "Fernandina, Octr. 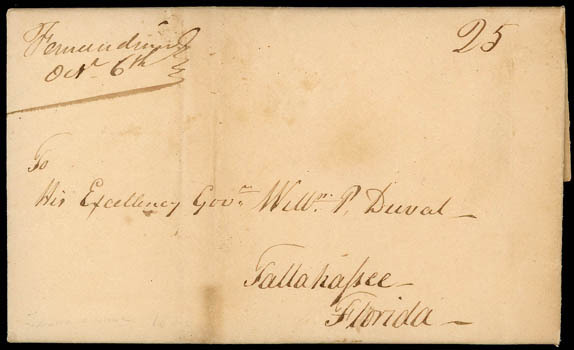 6th", manuscript two-line postmark with matching "25" cent rating on 1826 folded letter to Governor William P. Duval, Tallahassee, Florida, election content with letter signed by Domingo Acosta, the first postmaster at this post office; light tone spot, Very Fine. THE EARLIEST OF ONLY SIX RECORDED EXAMPLES OF THE FERNANDINA TYPE I POSTMARK. 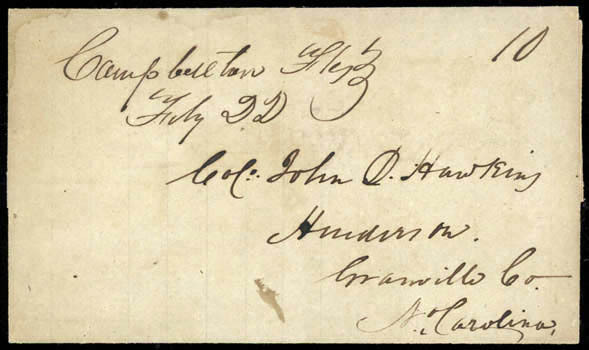 "Hickstown, Flor., Octr 1st", type II manuscript postmark and "Free" on 1831 folded letter to Tallahassee, Very Fine, letter concerns the election of a territorial delegate and mentions Hickstown postmaster Dennis Hawkins, one of only four recorded usages from Hickstown in private hands, ex-Thompson. 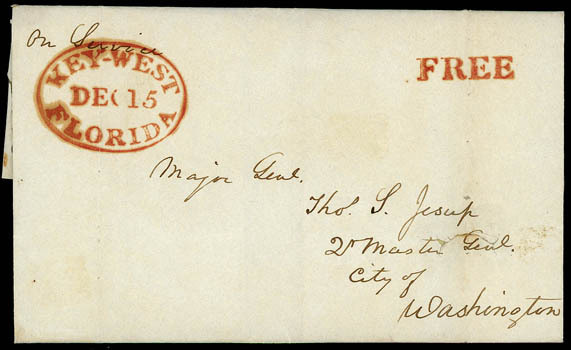 Key-West, Florida, Dec 15, remarkable bold strike and matching "Free" rating handstamp on clean 1832 folded letter to Major General Thos. Jesup, Quartermaster General, Washington D.C., endorsed "On Service" at top left, letter requesting supplies mentions that ships from New Orleans seldom stop at Key West while vessels from the North to the Gulf of Mexico pass close to the Key; small internal cover tear, Very Fine and attractive.